A full-page advert was recently published by Elie Wiesel (and purchased by Rabbi Shmuley Boteach through his organization, This World: The Values Network) titled “Jews rejected child sacrifice 3,500 years ago. Now it’s Hamas’s turn”. 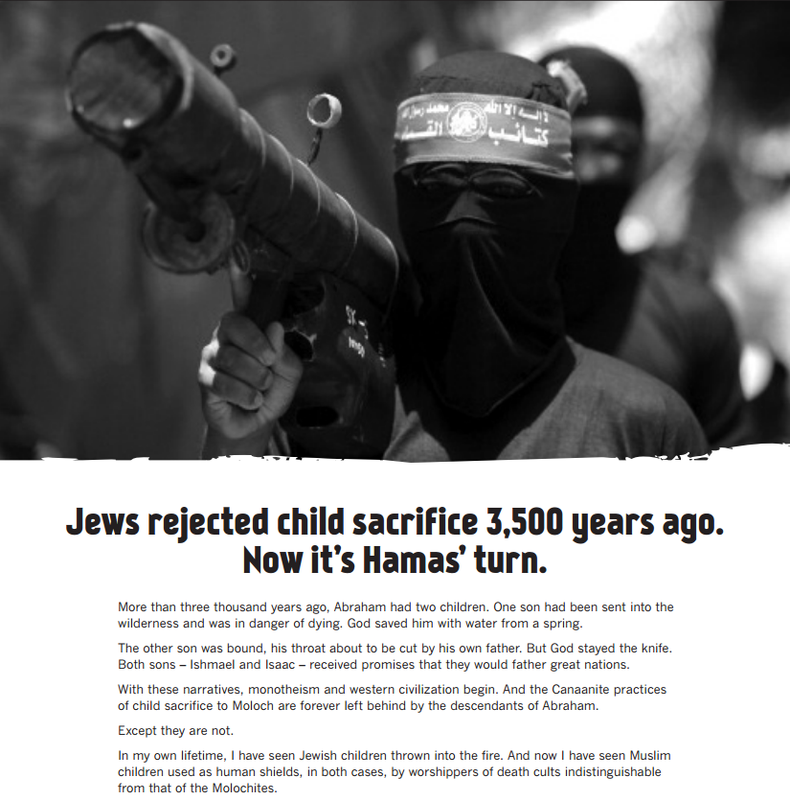 The ad condemns the Islamist group for using children as human shields, and invokes the Sacrifice of Isaac to frame the war between Israel and Hamas. The ad will reportedly appear in The Washington Post, The New York Times, The Wall Street Journal, The Chicago Tribune, The Los Angeles Times, The Miami Herald, but NOT in the London Times (aka, The Times). Interestingly, The Sunday Times (sister publication of The Times) didn’t seem so concerned with the feelings of their readers when they published a cartoon Holocaust Memorial Day in 2013, depicting the bloody trowel wielding Israeli Prime Minister torturing innocent souls. Though The Sunday Times later apologized for the cartoon following heavy criticism, it was not retracted. Who were Times editors concerned would be offended? Hamas? Money talks, the big money, to the editors without balls. In the seventies the west started to pay Palestinan terror organisations out of fear of terrorism, pretending that this will calm them and py off with time and here we are. The Times are worried that it “will cause concern amongst” their sales department. They think readers buy their paper to affirm their opinions, not to challenge them. Their loss. We have been wondering why Israel is so poor at propaganda which I think is a function of honesty and maturity of intent but it has left the ground open for the most vile of Hamas supporters to spread lies and falsehoods around the world. There should be much more of this bombarding the media with images of Hamas cruelty. noamy cry baby I thought it was you earlier. Now that there is a cease fire you’ve crawled out from hiding under your rock with all the other Hamas Fascist scum. Odd you should say that. I just got down a book by David Meir-Levi (probably Jewish) called “History Upside Down” The roots of Palestinian Fascism and the Myth of Israeli aggression. Worth reading, not you of course, but others here. I think one needs to except that the UK has a very different narrative to that of the Israeli’s. Most of the UK has lost the plot and thinks that there is a life for minorities within Islamofacism, never mind a jewish life. There is an utter disconnect between what Middle East Muslim reality is on the ground and the way it is perceived in the UK. We are seeing remnant’s of 1930’s Nationalism and the current Left’s inability to critique people because they are not white. Critiquing brown people is not done. That the Arab word has had a horrific record of despots and the insane leading them through many war’s does not register on the Left. That no Arab society is capable of providing wider society with mean’s to lead a dignified life is never mentioned. That from Turkey, to Iran to Egypt and most other Arab states, the minorities have either been driven out, reduced and abused. None of this is ever contextualized. People are pushing Israel into a fake peace with an Arab populace that has wished to kill it since the beginning of Islam. What a bunch of pansies. Freedom of Speech, which everyone likes to rally behind with cartoons and accusations, means very little when coming from the smallest of the Big Three. I think there is more to it, though. Had a weird Facebook conversation with the smartest kid in my high school class. He’s now a professor in Vermont. We co-existed fine 25 years ago. He always spoke in class, and I chose to remain in the back. But with social media, we’re buddies! In the same fashion of journalists feeding the frenzy in order to report on it, this guy posts a long diatribe complaining about the biblical nature of Zionism. The notion that This Is Our Land; God Gave It To Us. So I thought I would point out that Zionism is actually a secular movement, and that the modern state of Israel was determined through the Brits and French and League of and United Nations, but he and another ivory tower buddy of his wouldn’t have any of it. Like, vociferously. Batshit was the term THEY were using, which not only caused me to believe that the Smartest Guy in the Room is now a BDS moron, but that the anti-Israel sentiment is so deeply contained in easy summations that they won’t see it in any other way. Fact is, this ad, though secular, is just too religious. It offends the sensibilities of intellectual atheists because it happens to dumb down the situation for them. While they insist that Israel lives by way of fairy tales, they themselves see these fairy tales as silly notions rather than allegorical human emotions. That is what they find offensive. The stories they don’t understand, and the weird way we seem to talk. I have met people like your “friends.” They are completely unaware of the profound influence of currently popular myths on their own tightly held views. Sanctimonious hypocrites. It would be much better for a pro-Israel advertisement to appear simply quoting extracts from the Hamas Charter. Who coud object to that? the euphemism ,human shields, means that we can kill men women children , and blame the victims leadership for it, blaming the victims has long been israels only tactic to try and disguise mass slaughter , but no matter what the rhetoric , slaughter is slaughter. What would you have Israel do ? continue to run for shelter and do nothing about the rockets becuase Hamas use its people? Didn’t realize you believe Hamas are the victims in all this. No. It means that Hamas has committed war crimes against its own citizens, i.e., the victims. It is a touch less than clever how you tried to conflate the “victims[sic] leadership” with the victims, cybercrossdresser baby. Not so. It means we have to kill women and children. There are men so foul that they conspire to arrange the deaths of their own children and to do that they attack the children of the enemy. Monsters should never be defended in this way. “We’ll have more children so they can fight Israelis”. 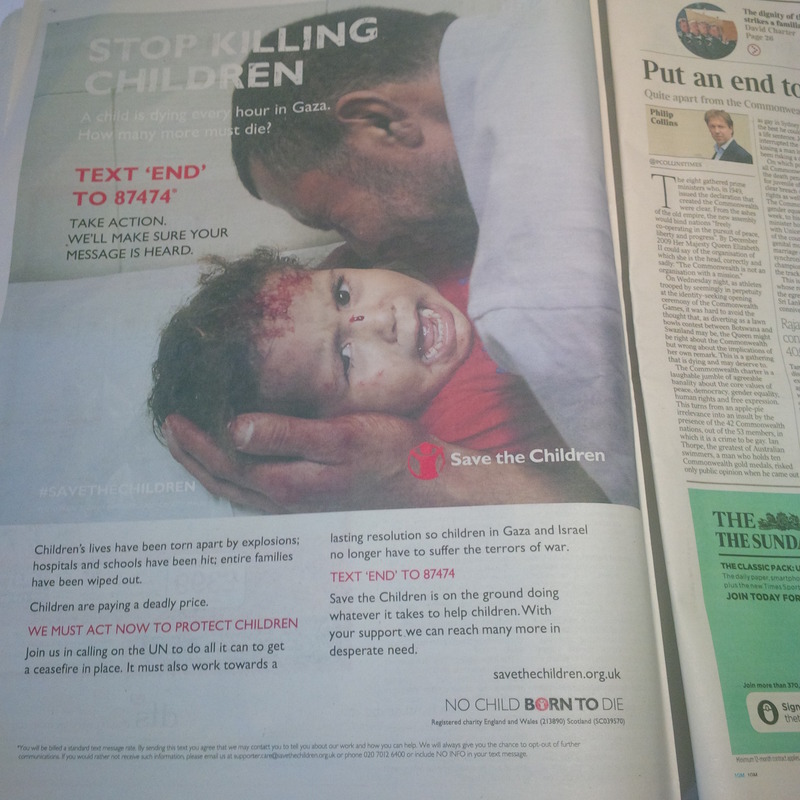 Save the Children, one of several charities with a hate-Israel agenda, has an ad in The Times the same day, listing the names of the alleged dead Gazan children. Running this anti-Hamas ad would have made the clear suggestion that these deaths were the responsibility of Hamas. Heaven forbid the thought. So The Times ran with the Save the Children ad and ditched that of the Peace Laureate. The former has much deeper pockets for future ads in the paper. I’ve read Elie Wiesel’s ad and I’ve looked at the Save The Children ad, and I have no doubt which one, if taken to heart, would ultimately save the lives of more children. Don’t smear Orwell by using his name. I’m embarrassed for you. I think the save the children ad should have a Hamas leader cementing the children of Gazza into the wall as that would be a more accurate reflection of the situation. The media are letting Hamas away with murder of their own people and using them as shields in this cowardly behaviour. If an impartial media placed the pressure on those who continue to shoot rockets into Israel to stop, Israel would cease fire tomorrow. This despicable behaviour will never cease while the media fuel Hamas with the propaganda they seek. The people of Gaza have been terrorised by Hamas long enough, please top supporting these racist terrorists who only seek the destruction of their neighbours at the expense of their own people. Actually, you’re responsible for this. The “action” is Hamas’ war on the Jews. It’s Hamas who tries to kidnap and kill Israelis. It’s Hamas who fired rockets at civilian communities. It’s Hamas that was blowing children to to bits on Israeli streets (not very photogenic dead baby photos you’re used to enjoying). It’s Hamas with the genocidal charter. It’s you who gives the green light to this. It is you who is responsible. How about you all do some good and donate to the Gaza Crisis appeal. Do you belive Hamas killed its own 160 children in order to dig tunnels into Israel? Using them as shields in this cowardly behaviour, what absolute nonsense, because Israel have just bombed and slaughtered despite this haven’t they , so what would be the point. If Israel did not kill because of the so called human shields then it matters, Israels actions prove that it’s irrelevant , made up story to justify slaughter. They carry on killing regardless , human shields or not, you must be so proud. Who’s the cowards now! As the Hamas is democratically elected, the people voted for slaughter, just like you. The same cynical calculation, terror means the neglect of human life and that`s why Hamas is defined as terrorist organisation and that`s why you support Hamas. The people voted to be slaughtered is what you should have written, how stupid you are, and how can they be terrorists if democratically elected, I still believe Israel are behind the rocket attacks, to give them an excuse to murder civilians, but the world are behind the people of Gaza. Noam can’t you be more original in the choice of ‘monikers’ you hide behind? Your lack of imagination is a clear indication of your lack of intelligence. how can they be terrorists if democratically elected Have you ever heard about the German democratic elections in 1933? Probably not. Jew-haters are always ignorant – no exceptions. Tony you know nothing. We not only want to slaughter every Palestinian civilians but we will have a huge profit selling their organs and their blood. but the world are behind the people of Gaza. Only the irrelevant part of the world. The muslim part of the underdeveloped countries, the social misfits plus far leftist intellectuals of the Western world – in short persons and states whose contribution to the human development is zero. No they voted for the rockets to keep on being fired at Israel. The election took place after Israel left Gaza and before the blockade. At that time more than 1000 rockets were fired at Israel by Hamas. so I guess they knew what they were electing Hamas for. I still believe Israel are behind the rocket attacks,? LOL just like people belive Jews control the world. I guess you are one of them.